Oh yes, sing along. Whether in your car, in the office, or in the store, you know the Christmas songs. They get played during that time of year every year. And quite frankly, some of them are pretty darn catchy. So go ahead, sing along when you get the chance. It’ll brighten your mood and almost certainly the mood of the person next to you as well. Even if singing isn’t your strongest talent, you can always hum along. Remember, cheerfulness is contagious. Make this season a little brighter and add a little excitement and fun to any mundane office party by adding Christmas Carol Karaoke. Note: A music-themed employee party meets budget concerns while also adding entertainment value. · Entertainment: You must have a karaoke machine for this event or consider hiring Dance Bands to handle this level of fun. We certainly recommend throwing in the holiday jingles everyone knows by heart. 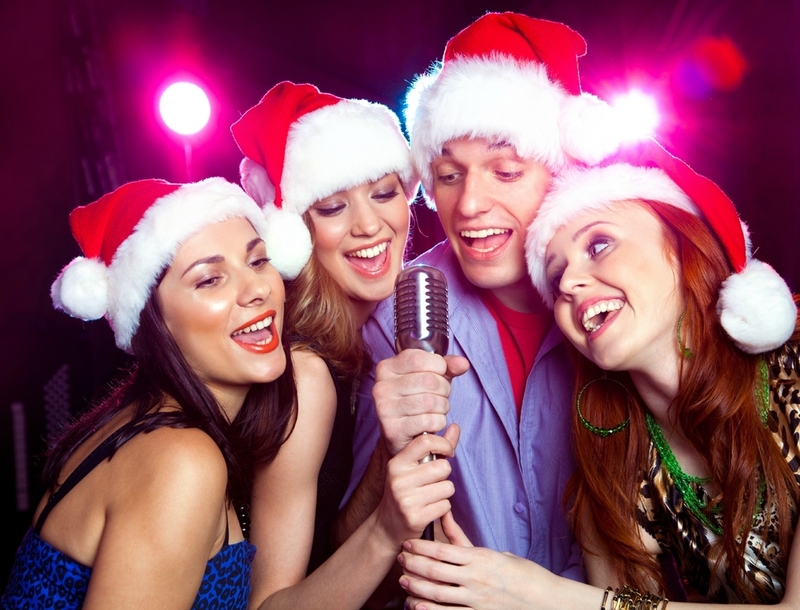 Ask employees and guests to sign up to sing their favorite holiday songs solo or in groups. Create and encourage a musical competition for the evening, either in the form of karaoke, music lyrics competitions, Rock Band or Guitar Hero tournaments or another music-related competition. People can really get into this sort of thing, I PROMISE (as long as you have the right promoter running the show). Also, consider limiting the karaoke to certain portions of the event, depending on how many guests you are expecting. Hire a DJ or live band for the latter portion of the evening. · Décor: On each table, you can wrap small boxes (with or without presents inside) in music sheet paper and paper with Christmas-themed lyrics printed out. Music notes and general holiday décor can also adorn the rest of your venue. Shimmer and sparkle is always a good way to go with the holiday theme. · Menu: Any kind of menu in which you dream up will work for this theme. You can go with appetizers and hors d’oeuvres only, a buffet dinner or even a full plated meal. If you are looking for a WOW presentation I suggest living table servers, such a stunning and classy way to serve food and beverages (Dance Bands can also provide this set-up). Also, a little" holiday cheer" or "liquid courage" can wet the whistle for the karaoke pros and for the karaoke wannabe's. · Dress: I would personally go with the "ugly sweater" attire, along with a dance off contest for the "ugly sweater" participants. Allow sweater models to cat-walk (dance) and strut their Christmas stuff. If this is a little too tacky for your taste, then go with a nice type of casual dress attire. Guest will fill more willing to party if the dress is more on the relaxed side for this kind of event.